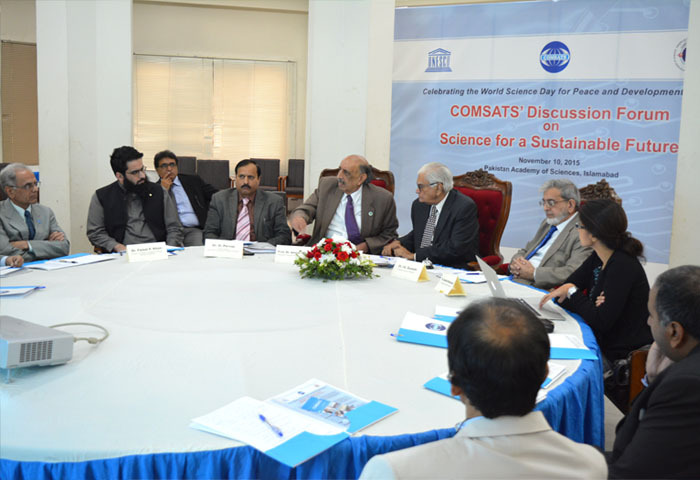 The Commission on Science and Technology for Sustainable Development in the South (COMSATS), in collaboration with the Pakistan Academy of Sciences (PAS) celebrated the World Science Day for peace and Development 2015, November 10, 2015, by holding a discussion forum on ‘Science for a Sustainable Future’, at the latter’s premises in Islamabad. Dr. Ishfaq Ahmad, Chairman Board of Governors, National Centre for Physics, Islamabad, and former Advisor to the Prime Minister of Pakistan on Science and Technology, graced the occasion as the Chief Guest of the event. 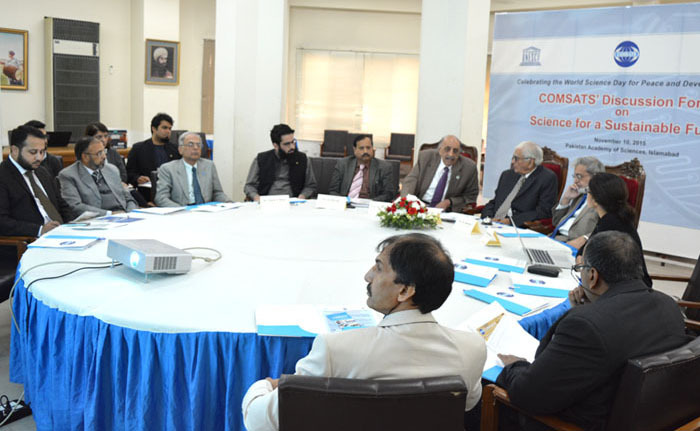 Speaking on the occasion, Dr. Ishfaq Ahmad recalled the efforts made by h im to have the World Science Day designated as one of the International Days observed by the UN in order to highlight significance of science for the betterment of society. Elaborating on the idea of the benefits of science for development, Dr. Ahmed emphasized that the modern scientific and technological developments can help societies to duly utilize the renewable energy sources, like hyrdo, solar, wind and geo-thermal, for reducing dependence on fossil fuels, to achieve cost effective and environment friendly outcomes. He was of the opinion that pure and social sciences should be taught and applied simultaneously for achieving sustainable development. He also urged the need to harness the potential of young scientists and supporting their work to help prepare them to take up future challenges. 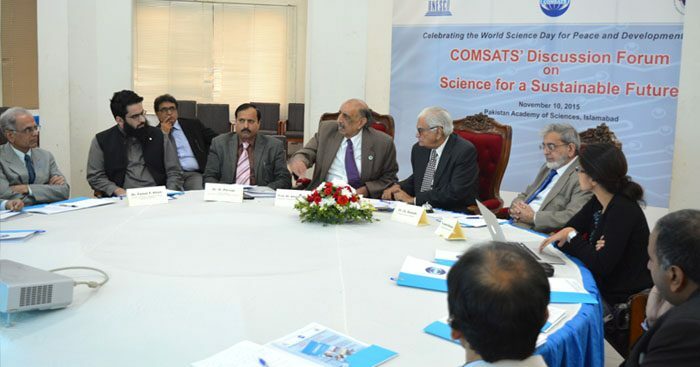 Dr. Ahmad praised COMSATS for its leadership role in regularly celebrating the World Science Day in Pakistan, and appreciated the organization’s continuous pursuit of its mission of promotion of science for sustainable development. Earlier in his opening remarks, the Executive Director COMSATS, Dr. I.E. Qureshi, expressed his desire to continue holding the World Science Day celebrations in partnership with relevant organizations in order to sensitize policy makers, politicians and the public at large on the role of science-led development. Expressing his consciousness of the darker aspects of application of S&T, he deemed the orientation of the international day towards Peace and Development very significant. He highlighted the significance of this year’s Day with respect to it falling between two significant events relating to sustainable development – adoption of Sustainable Development Goals (SDGs) by the UN General Assembly on 25th September 2015 and the upcoming 21st Conference of Parties (COP21) of the United Nations Framework Convention on Climate Change, to be held in Paris, France, from 30 November – 11 December 2015. He informed that COP21 would aim at achieving a legally binding and universal agreement on climate to keep global warming below 2°C. He pointed out the contradiction of the World Bank estimates that, by 2030, over a hundred million of the world’s population would become poor, and the SDG 1 to end poverty and hunger in all its forms everywhere by 2030. He reminded the participants of the meeting about the Foreign Aid related clause of the Addis Ababa Action Agenda that aims to achieve the target of 0.7 per cent of gross national income for official development assistance, and 0.15 to 0.20 per cent for least developed countries, and looked forward to seeing how it pans out in the long haul. The President of PAS, Dr. Anwar Nasim, noted that the role of the Academy has always been to sensitize the political leadership about the centrality of science towards social and economic progress. He highlighted that science has overall remained grossly under projected as a driving force for development. He opined that amid the public expressions of recognizing science as a vehicle for socio-economic development by political leaderships and decision-makers of the developing countries, very little is being done to back these statements. He noted, in the context of Pakistan, that problems faced by the country are well-understood, and so are their solutions. However, the lack of implementation is the sole reason for lack of improvement. Dr. Nasim said that World Science Day is an opportunity to make a commitment to encourage young scientists to take a leadership role in future. He urged the developing countries to make stronger and concerted efforts to beat the odds impeding the suitable growth of their S&T profiles. He pledged the Academy’s support for any useful initiative aiding the efforts made in this direction. He also appreciated COMSATS Science Diplomacy Programme launched in 2014, as a major initiative for advocacy of science. The technical deliberations of the event comprised of three statements on: ‘Status of S cience in a contemporary Pakistani Society’ by Dr. Ayesha Razzaque, an Independent Education Consultant; ‘The Case for Next Generation of Life Sciences’ by Dr. Faisal F. Khan, Director, Institute of Integrative Biology, CECOS University of Information Technology and Emerging Sciences; and ‘Energy Options for a Sustainable Future’, by Dr. M. Pervaz, Director-General, Hydrocarbon Development Institute of Pakistan. Dr. Razzaque presented a case for creating a science literate society based on the fact that scientifically literate societies make informed and sustainable choices, particularly in areas of healthcare, energy, and environment. She advocated that basic knowledge of science and scientific method should be widespread in a society as populations that are not science savvy to some extent are more gullible to fraudulent practices. While emphasizing on educating the school children to be taught science with due consideration of its practical uses in life, she also urged that efforts should be made for all adults to be able to retain scientific thinking and approaches in their everyday life and decision making. In this regard, she emphasized the role of media for diffusing the necessary knowledge in the society. Dr. Faisal Khan asserted the urgent need to encourage start-ups to bridge the gap between academia and industry in Pakistan. He stressed that education should not only be about enrolment and retention in primary schools, and should help address concerns related to the value chain keeping in view the needs of higher education and employment. He highlighted the poor quality of science education, redundant teaching methods, the pre-medical and pre-engineering bifurcation, and lack of incentives as policy problems that need to be addressed to promote technology transfer and entrepreneurship at later stages. He opined that developing countries cannot take on science for the sake of science alone, but should be able to derive economic benefit from it to meet their development needs. In this regard, he elaborated how the developed countries have been benefitting from emerging trends in sciences. With reference to Biology, he shared how investing in genome technology, big data, and integrative biology have enabled nations and organizations to financially benefit at exponential rates. He considered emerging trends related to Synthetic Biology as one such opportunity for Pakistan and urged for the relevant quarters to take immediate measures to optimally benefit from it. He underscored the need to revise the science and technology strategy and rationalizing the priority areas based on their socio-economic benefits as well as to suitably tap the potential of the technological revolution worldwide. He strongly urged interdisciplinarity in teaching and application of science. Dr. Pervaz stressed the need to build capacities to utilize indigenous energy resources and improve relevant technology base. He stated that developing countries need to adopt more rational approaches towards production, distribution and consumption of energy. He advocated technology transfer and technical cooperation among the countries, and diversification of energy supply as means for achieving reduced energy imports. With respect to the United Nations Conference on Environment & Development, Rio de Janeiro, Brazil (1992), he highlighted the social, economic and environmental dimensions of energy sector in Pakistan. He stressed on cutting down energy losses from production to distribution, diversification of energy options based on the local resources of an area, and reduced import dependence, as means for achieving sustainability. Moreover, he called for developing and making renewable energy sources more affordable and efficient in order to secure clean energy options for future generations. The statements were followed by a discussion session moderated by Dr. Anwar Nasim. 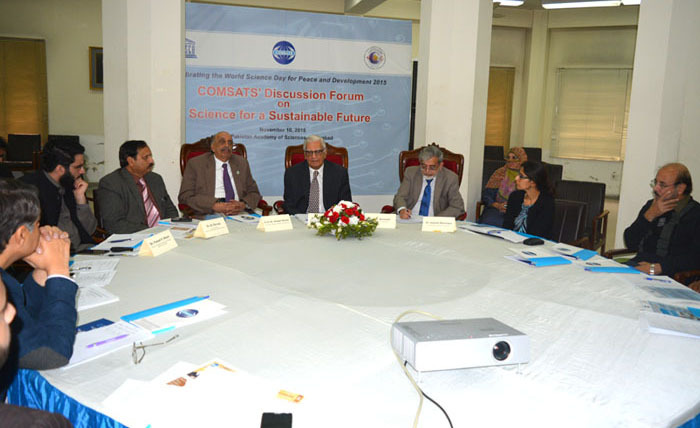 The participants of this session included, Dr. Manzoor Soomro, President ECO Science Foundation; Dr. Zabta Khan Shinwari, Secretary-General of PAS; Dr. Hamid Saleem, Former Director-General, National Centre for Physics, as well as COMSATS’ Science Ambassadors, Dr. Arshad Saleem Bhatti, and Dr. Athar Hussain. Also present on the occasion were other officials of COMSATS Secretariat: Mr. Tajammul Hussain, Advisor-Programmes; Mr. Abdul Majid Qureshi, Research Scholar and Coordinator for Word Science Day; Ms. Huma Balouch, Sr. Assistant Director-Programmes and Coordinator for World South-South Cooperation Day. Highlighting the importance of ethical aspects of science, Dr. Qureshi informed th e participants that Dr. Shinwari has received the UNESCO’s Avicenna Prize for Ethics in Science 2015, and endorsed his views given in a recent interview that neglecting science itself is unethical. Dr. Nasim stressed the need for making societies science conscious and considered documentation of good ideas a small but useful measure in this direction. He urged the concerned quarters and individuals to make efforts to promote science in the country, despite the hardships involved. Dr. Razzaque highlighted the need for updating scientific curricula to help the students in understanding the practical implications of science. Dr. Faisal stated that there is a need to revisit the existing R&D and S&T related strategies and devise a roadmap better suited for indigenous needs. He also urged the relevant government institutions to ensure due projection of science through electronic media to reach out to masses, and suggested necessary lobbying and thrust building in this regard. He believed that the disproportionate focus on primary education should be revisited to address other important issues like technology transfer between academia and industry. He stressed that academia should make efforts to bring out products and processes for commercialization, apart from publications and articles. Dr. Qureshi was of the view that scientists have the responsibility to be more interactive and vocal outside their community as well to sensitize the masses and governments about the importance of science. He believed that the politicians only pay lip-service to the importance of strengthening S&T sector, and do not pay sufficient attention to administrative facilitation and financial resources to achieve the desired objectives. Dr. Shinwari considered Global Innovation Index and Human Development Index two important parameters for nations to objectively evaluate their own standing. He deemed the trends of increasing the number of publications a threat to creativity and novelty in scientific research and urged the relevant institutions to take measures to discourage such trends. He opined that countries should transcend the concept of ‘national interest’ in favour of ‘human interest’, which is in line with the spirit of the World Science Day for Peace and Development. 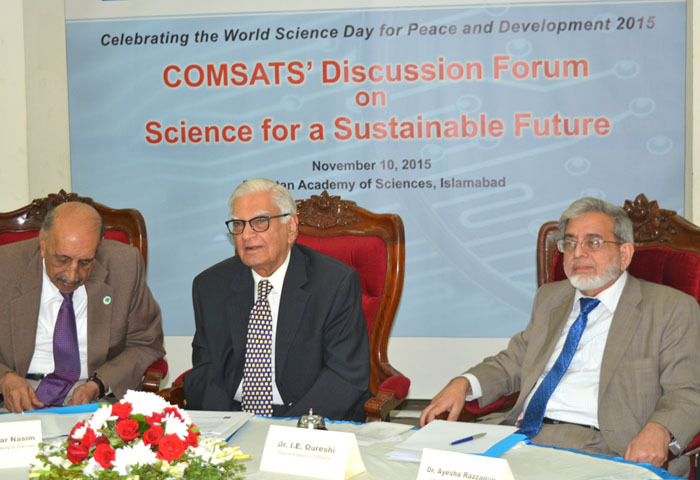 Dr. Saleem urged the scientific community to adhere to the values of intellectual honesty. Dr. Bhatti was of the view that reversing brain drain will only be beneficial if necessary measures are taken for necessary infrastructure building to accommodate the homecoming scientists and benefit from what they have to offer. Endorsing the views shared during the discussion, Dr. Nasim advised that debate on the important issues raised should continue in future for achieving tangible outcomes. The event concluded on the revitalized pledge to continue efforts in individual and institutional capacities for promotion of science at various levels. The participants resolved to voice concerns of scientists at appropriate quarters in an effort to develop a political will supportive of a science-based agenda and called for enhanced efforts on part of the government in deploying resources to address the state of Science and Technology in the country. In this regard, the apathy of media to project relevant issues was noted with dismay.